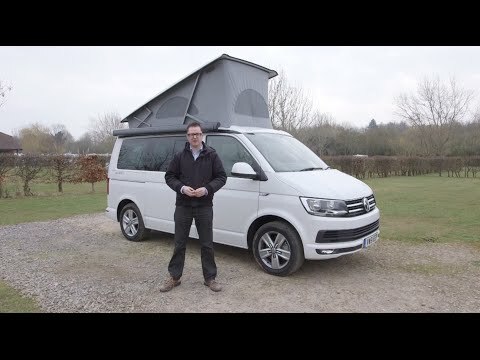 There’s the Volkswagen California, and then there are VW-based campers…  The difference? The California is the only campervan that’s completely manufactured by Volkswagen: the rest are made by specialist manufacturers of varying degrees of pedigree. Now we have the T6, the latest-generation Volkswagen Transporter, on which the VW California Ocean you see here is based. It may not look that different from the T5 that it’s replaced, but it’s meant a choice of cleaner, more fuel-efficient Euro 6 engines, all manner of safety enhancements and more. Indeed, Volkswagen lists some 6000 changes to the T6 over the T5. Some of the most significant in terms of safety include a Driver Alert System, Brake Assist, an Automotive Post-Collision Braking System and so on. In short, it’s the best VW Transporter to date: it’s more powerful, more economical, quieter, better equipped, sturdier and safer. Yes, it’s more expensive. But the overall dimensions remain exactly the same as those of the T5. In T6 guise, there are two flavours: Beach and Ocean. Here we have the latter and the higher-trim Ocean is a standard-bearer for the entire class of T6-based ’vans, and a great indicator of the characteristics you can expect when a carmaker turns its attention to campervan production. The furniture and mouldings are of superior quality. Volkswagen also retains the premium dashboard for its own product. Integral blinds for the side and rear windows, all-LED rear lights, twin chrome strips on the front grille (rivals just get the single ones) and other details are reminders that the Ocean is a cut above the rest of the fleet. It is by no means perfect, though. Practicality may not always have been at the forefront of its designers’ thoughts. The gas cylinder surrounded by the fresh water tank isn’t liked by everyone. And while overall storage is decent, it lacks the imaginative ideas that other converters can offer. Moreover, despite being able to call upon lots of optional extras, the majority of these focus on the base vehicle rather than enhancing the camping side of things. The conversion isn’t switched to right-hand drive, either; hence, the sliding door is on our offside (we appreciate its power latch, but that doesn’t compensate). The small, top-loading fridge is definitely a love-it/loathe-it item. In addition, interior lighting is acceptable, rather than generous. Nevertheless, the majority would agree that here is a campervan that is head-and-shoulders above its contemporaries. It needn’t cost more, either. Spec-for-spec comparisons actually favour the California – especially because the standard equipment includes clever features, for example, the electrically operated aluminium elevating roof, an outdoor table that is stowed in the sliding door, folding lounge chairs in the tailgate and a programmable diesel heating system. It’s a full four-berth from the start, too, and the better bed is the one in the roof. The rear seat is automotive quality and boasts fold-away head restraints. There’s an option to add a fifth, removable, travel seat, too. Volkswagen only offers the California Ocean with two choices of engine – the 150PS and 204PS – albeit along with a range of DSG automatic transmission and 4Motion all-wheel driving configurations. The ’van tested has the larger engine and the automatic gearbox. There’s no doubt about it: the VW California Ocean is the ‘real thing’ in the Transporter market. Compare specifications and it actually compares well with its rivals on price. You get an added bonus, too: it won’t lose as much of its value over time as other ’vans would. It may be the world’s second largest carmaker, but Volkswagen still takes a keen interest in the campervan market. It typically sells some 400 Californias at 36 of its van centres, arguably making it the most popular camper in the UK. If you want to be one of them, head to your local Volkswagen Van Centre. And to see other VW campervans for sale, click here.